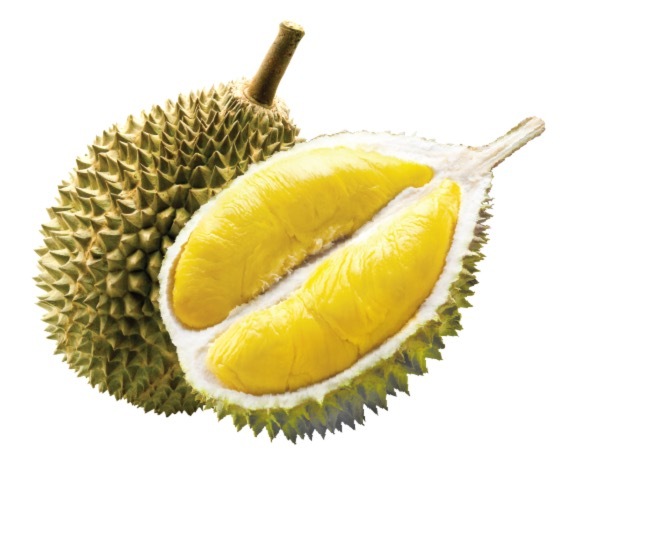 Durian fruit, meaning "thorny fruit" has hard outer shell that is laced with a number of thick, dense thorns. Containing four to six pods, the flesh has a very distinguishable, malodorous, full-bodied aroma. Once ripe, the skin can be easily cracked open to reveal its golden yellow flesh nestled into the pods that bear large nut-sized seeds. The flesh has a meaty, custard-like texture with a flavor that is similar to its aroma: a combination of savory, sweet and pungent, often compared to rotting fruit, with notes of banana, caramelized onion and aged blue cheese.